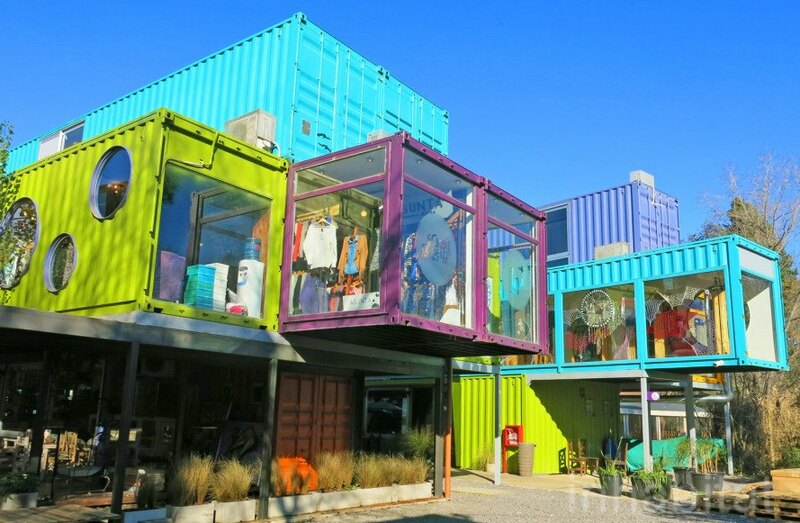 London's got one, New York's got one, and now Buenos Aires has a hip mall built with stacked shipping containers. 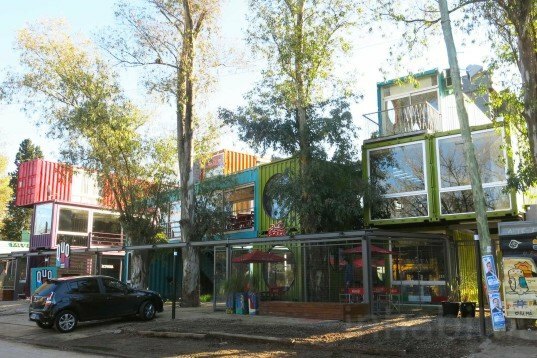 Designed by BZZ Arquitectura, the QUO Container Center is comprised of 57 colorful painted steel boxes that shelter a small community of local businesses. Topped with a luscious green roof and solar panels, the mall features restaurants, offices, eco-friendly retail stores, as well as a gallery space with a cafe. 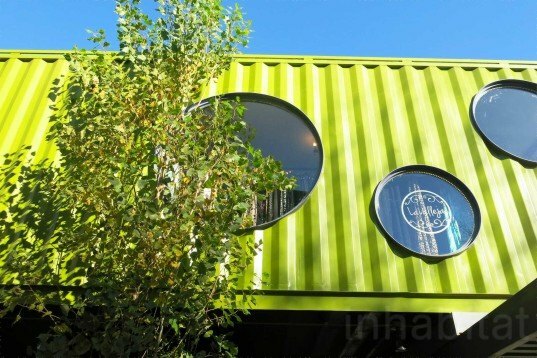 BZZ Arquitectura’s founder Cecilia Bertezzolo designed QUO Container Center and EcoSan built it. It is situated in a leafy town, an hour and a half away from the capital of Argentina, called Ingeniero Maschwitz. Perfect for a weekend escape from the bustling city, Quo is the place to go to find unique clothes and objects, have lunch al fresco and enjoy some nature. 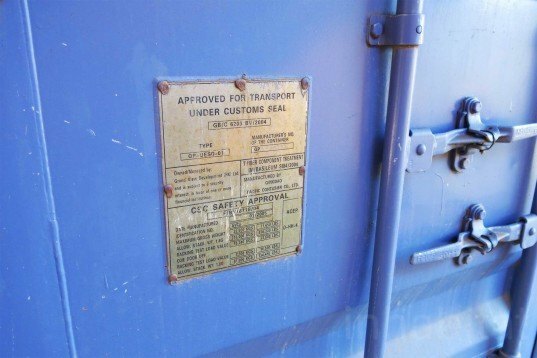 It consists of 57 maritime containers rescued from the port and arranged to ensure plenty of open green spaces. The restaurants, contemporary offices, eco-friendly clothing and decor shops as well as a gallery-cafe are scattered throughout the triple-storey mall. One of the eateries is completely glazed and suspended like a bridge, offering a space to eat, see and be seen, literally. Inspired by London’s Container City, this colorful mall also features round apertures similar to a porthole. These flood interiors with natural light and frame window displays. 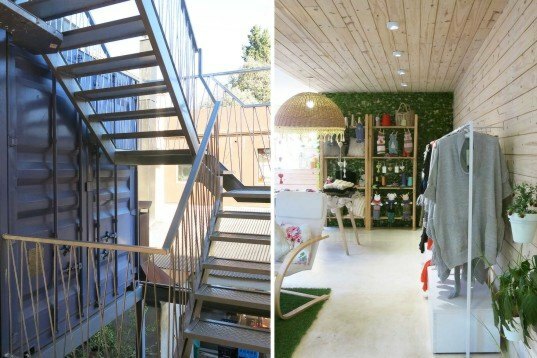 Access to the upper levels is achieved either via outdoor staircases or elevators inside the stacked containers, which are wheelchair accessible. From above one can admire the surrounding treetops or peer down into the restaurants and shops. QUO’s grand sunny terrace is filled with deck spaces that provide visitors an opportunity to catch fresh air and sunlight. But as the sun in Buenos Aires is very strong, the architects provided shade in the form of sturdy water resistant fabric tensed by three anchor points. An array of solar panels transforms free energy from the sun into electricity, which is used for the mall’s LED-lit common areas. Most of the offices are located on the terrace level. The mall’s 3,300 sq foot of green roof also helps to improve thermal insulation and improve air quality. 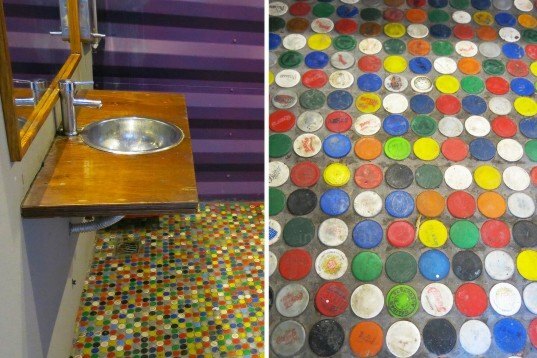 As there is no space for toilets inside the containers, visitors are encouraged to use public toilets, all of which have floors adorned withPisotapitas colorful bottle tops. Other sustainable details include repurposed planters and elegant rotomolded polyethylene bins designed by renowned architect Diana Cabeza. At the entrance a container wall painted by local kids greet customers with positive drawings that reflect the local attitude. QUO is located in Mendoza 1667, Ingeniero Maschwitz, Buenos Aires, Ruta Panamericana, Acceso Norte, Ramal Escobar km 44 and opens from Tuesday to Sunday from 10am-7pm. 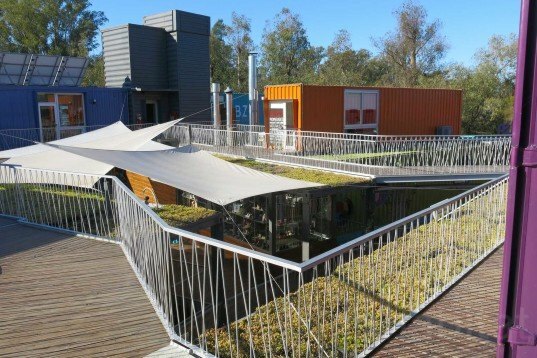 BZZ Arquitectura's founder Cecilia Bertezzolo designed QUO Container Center and EcoSan built it. It is situated in a leafy small town, an hour and a half away from the capital, called Ingeniero Maschwitz. Perfect for a weekend escape from the bustling city, Quo is the place to go for unique clothes and objects, have lunch al fresco and enjoy some nature. It consists of 57 maritime containers rescued from the port and arranged in different ways, leaving open space for gardens or resting. Restaurants, contemporary offices, eco-friendly clothing and decor are scattered throughout the triple-storey space. One of the eateries is completely glazed and suspended like a bridge, offering a place to eat, see and be seen, literally. Inspired by London's Container City, this colorful mall also features round apertures. The apertures flood interiors with natural light and frame window displays hinting what's inside. Access to the upper levels can be reached through stairs or elevators. The mall is wheelchair accessible. From above one can admire the surrounding treetops or peer down into the restaurants and shops. 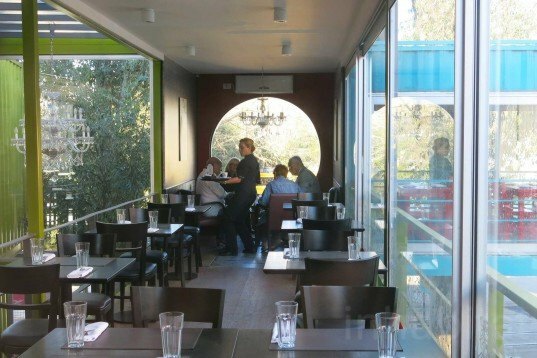 QUO's sunny terrace is filled with deck spaces to allow visitors to enjoy fresh air and sunlight. But as the sun in Buenos Aires is very strong, the architects included sturdy water resistant fabric tensed by three anchor points to provide shade. The three triangular shades help cool down the mall's interiors while allowing customers to shop--even in rainy weather. An array of solar panels transforms free energy from the sun into electricity, which is used for the mall's LED-lighted common areas. Most of the offices are located on the terrace level. The mall's 3,300 sq foot of planted green roofs improve thermal insulation, produce extra oxygen and add natural beauty to the industrial building's crown. As there is no space for toilets inside the containers, there are plenty of public ones, all complete with colorful bottle tops pressed into the floors. Other sustainable details include repurposed bottle planters and elegant rotomolded polyethylene bins designed by renowned architect Diana Cabeza. 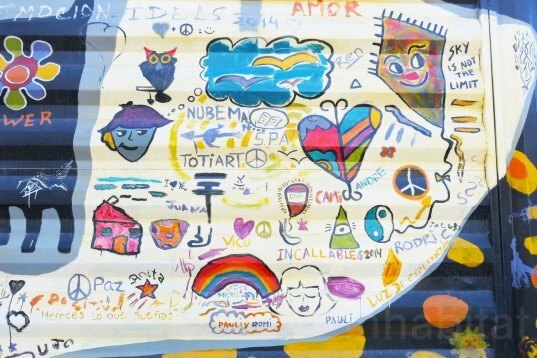 At the entrance a container wall painted by local kids greets customers with positive drawings that reflect the local attitude. QUO is open from Tuesday to Sunday from 10am-7pm.